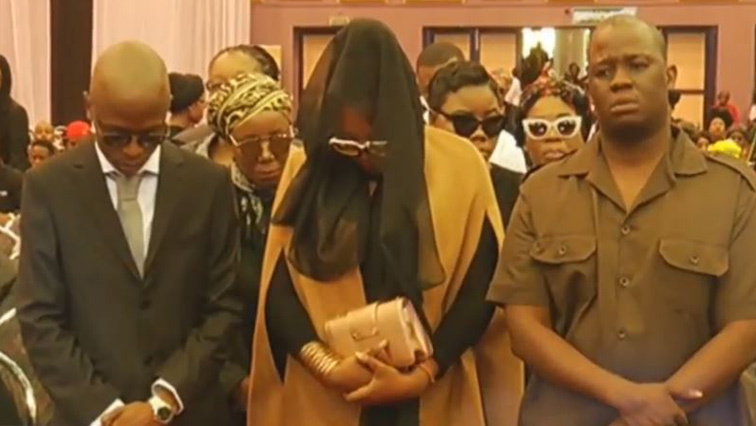 HHP’s widow attends his funeral - SABC News - Breaking news, special reports, world, business, sport coverage of all South African current events. Africa's news leader. Lerato Sengadi is pictured bending her head at the official funeral service of her late husband Jabulani ‘HHP’ Tsambo. Lerato Sengadi, the widow of artist Jabulani Tsambo, affectionately known as ‘HHP’, has arrived at the Mmabatho Convention Centre in Mahikeng, where the artist’s civic funeral service is underway. Family, friends, government representatives and celebrities are attending the funeral. On Friday, the High Court in Johannesburg confirmed that Sengadi was the artist’s customary wife. However, her urgent application to interdict the funeral was turned down. Sengadi argued that the Tsambo family was side-lining her and had told her she was not welcome at the funeral as they did not recognise her as HHP’s widow. Fans and members of the public are out in numbers to honour and pay their last respects to the king of Motswako. His colleagues in the music fraternity are expected to honour him with musical performances aimed at celebrating his role in South African hip hop. North West Premier Job Mokgoro is expected to give a eulogy. HHP will be laid to rest at Mmabatho cemetery in a section of the cemetery known as the Heros’ Acre. This entry was posted on 03 Nov 2018,08:04AM at 8:04 AM and is filed under Lifestyle. You can follow any responses to this entry through the RSS 2.0 feed. Both comments and pings are currently closed.